This time it was Harrisburg who pulled off the remarkable comeback — to stun the Riverhounds, 4-3 on Sunday. After trailing 3-1 late in the second half, and playing down a man, the Harrisburg City Islanders showed their Keystone Derby rivals — Pittsburgh Riverhounds — that they can stage a pretty improbable come-from-behind victory of their own. It was another match that saw many twists and turns, much like their previous encounter, on May 30 at Highmark Stadium when Pittsburgh stormed back from deficits of 3-0, 4-1 and 5-3 in stoppage time for a thrilling win for the ages. On Sunday at Skyline Sports Complex, Harrisburg returned the favor with a comeback that may have been just as improbable. Here are my three takeaways from what was a remarkable turn of events in the third leg of the Keystone Derby. In the 65th minute it appeared that Harrisburg was left for dead. In match where they had pretty much been outclassed for over an hour, Harrisburg were then handed a cruel pair of blows. First, conceding an own goal in as the Riverhounds played a long ball over the top that Harrisburg defender Shane Johnson appeared to shield Lebo Moloto away from the ball. But as he was fighting off the oncoming Moloto, and Harrisburg’s goalkeeper Nick Noble came out to play the ball — the ball bounced off Johnson and into the goal to give the Hounds what seemed like a commanding 3-1 lead. A few moments later, things got worse for the City Islanders as they watched as one of their players, Jose Barril have a complete meltdown. After a reckless challenge on Riverhounds’ Rob Vincent, the Spaniard completely lost his composure. Arguing with the official, he punted the ball away and stormed off the field kicking an advertisement banner as he was shown his second yellow of the game. 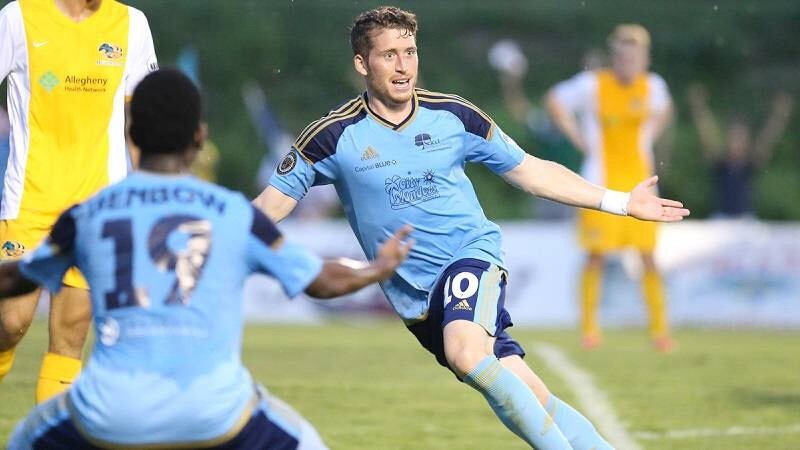 A comeback seemed impossible at that point for the City Islanders as nothing was going their way. The Riverhounds continued knocking the ball around and possessing at will — and had a few nice build up in possessions — one that led to a breakaway for Tyler Pasher, but Noble came off his line to take away an almost certain goal in the 70th minute. That seemed to flip the momentum. Suddenly, playing down a man, Harrisburg picked up their play. The Riverhounds had to know — that no lead in this Keystone Derby would be safe. Harrisburg began sending balls over the top of the Riverhounds back line and unleashed second half sub, Cardel Benbow, who used his speed to cause all kinds havoc. It was a makeshift defense for the Hounds, which included newly added Connor Donovan, on loan from Orlando City SC as injuries forced regular starters Sterling Flunder and Fejiro Okiomah to miss the match. Instead of crumbling to the Riverhounds, who were seemingly in control of the match, Harrisburg exposed some holes in Pittsburgh’s back line scoring three goals to stun their rivals, including one in stoppage time by Jason Plumhoff, his second of the night. The Keystone Derby is turning into the United Soccer League’s version of Ali-Frazier, Steelers-Ravens, Yankees-Red Sox. Last week after a disappointing loss to Louisville City — at the time Riverhounds midfielder Kevin Kerr looked at this game and said that it would be “six-point” game. Indeed, the Hounds after failing to get a point still have 25 points, as they are now tied with Harrisburg in the standings for the sixth and final playoff spot in USL’s Eastern Conference Standings. If they won, or even held on for a tie, they would have been in command of that final spot staying at a minimum of three points clear of Harrisburg. A win would have even tied them with NY Red Bulls II at 28 points for 5th place. Instead, Harrisburg now shares the sixth place spot in the standings as the Keystone Derby rivals are separated by three goals — the difference in their first game (5-2 Pittsburgh win way back on March 28), while the City Islanders (7-6-4) have two games at hand. In three games the two combatants have combined for 25 goals — with the last two being decided by improbable comebacks. The Riverhounds have scored 14, Harrisburg 11 — and there have been a total of 4 goals scored in the end of regulation stoppage time. To say Pittsburgh owner Tuffy Shallenberger was not happy with the result would be a gross understatement. Check out his tweet immediately after the match. The match was physical, hard fought — and with lots of pushing and shoving. Vincent, Anthony Arena and Hounds captain Danny Earls each had their spats with the official as well. Vincent and Arena were booked, and that leaves Arena to have to sit out the next game, Saturday at home against the Wilmington Hammerheads. Instead of building their lead in the standings — the Riverhounds now likely will be in a dogfight the rest of the way to earn a playoff spot — and it will likely come down to their final game of the season. And guess who they play in that final game? That’s right folks. Harrisburg City Islanders. Keystone Derby Part IV. The Final Chapter. In a season of many ups and downs, this has to be the tough blow for the Riverhounds and their coaching staff. After bringing their record to 7-5-4 in early July, they’ve lost three games in a row for the first time all season to drop to 7-8-4. The coaching staff seemed to pull all the right buttons. There were some very encouraging signs for the first hour of the match. The loan pick up of the young Orlando City FC product Donovan seemed like a good pairing with Arena in the central defense. Head coach Mark Steffens shuffled the line-up a bit too — putting Rob Vincent in the defensive, holding midfield along with Danny Earls. The pair really seemed to provide rock solid presence in the first half. Vincent’s diagonal ball to Kevin Kerr on the outside right side was perfectly placed in the 7th minute — leading to a cross and Amara Soumah’s goal. Then Soumah, who Steffens gave his first start, created an opportunity on his own, making a nice move past Johnson, sending a cross from the left end line that Johnson knocked away with his hand — causing the official to call a handball in the box to set up a penalty. Vincent stepped up to deliver his 13th of the year to give the Hounds what seemed to be a commanding 2-0 lead. Toward the end of the first half, they relaxed for a bit. Plumhoff took advantage — with room to shoot on the left side, outside back Willie Hunt didn’t close enough on his shooting space, and from distance he drilled a shot into the upper corner that Calle Brown had no chance of stopping. A commanding 2-0 lead — had become a tight 2-1 affair at the half. Again — no lead would be safe. Soumah, after a terrific first half had two point blank shot opportunities from just outside the box at the outset of the second half that would have likely put the game away (I know — no lead is safe), was then taken off for Pasher before the 60 minute mark. Again, the move by all indications was brilliant– as Pasher playing on the left wing immediately sparked two dangerous runs beating Harrisburg defenders and sending a couple crosses from the flank. Like Joe Frazier in Manilla or the Yankees after three games in 2004 against Boston, the Riverhounds were unable to land the knockout punch to their rivals. The Riverhounds coaching staff and back line had no answer for Benbow’s speed — and Harrisburg’s persistence. They brought on Anthony Virgara and Stephen Okai, who provided fresh legs and energy, but suddenly the cohesion that they had in stringing together passes seemed to dissipate — and the organization of their backs and midfielders that held up for most of the game came apart. Now it’s back to the drawing board for the Riverhounds. With nine games left, they can still salvage this season. We’ll see on Saturday against Wilmington if they can end this tough run of play. ANALYSIS: Are the Riverhounds Running Out Of Steam?